The making of another beauty on Basin street in Griffintown. If this construction turns out moderately nice, I'll be shocked. La conception d'une autre beauté sur la rue Basin dans Griffintown. Si cette construction se révèle moyennement agréable, je serai en choque. What's going on in Montreal? A city that was famous for its amazing architectural heritage is building all this dreck. Montrealers better wake up before the whole city is full of garbage like that building in your photo. This is the 'Before' picture, right? 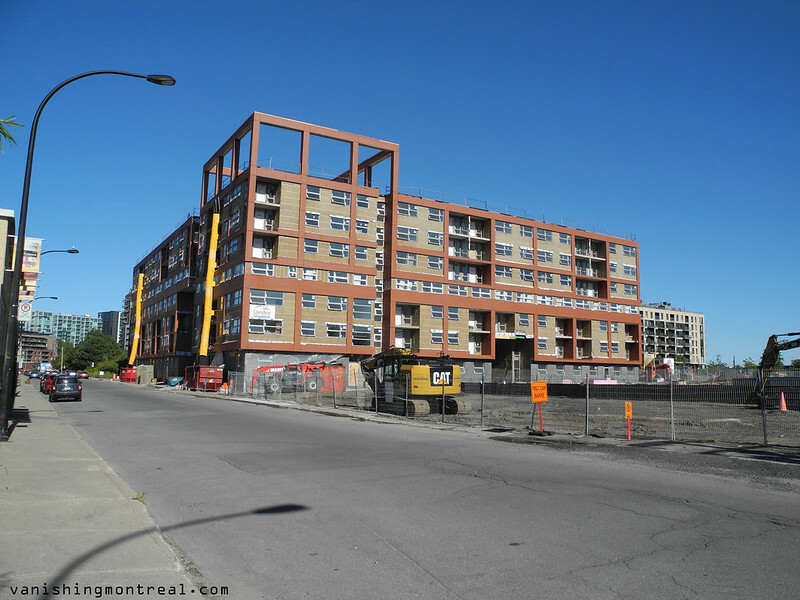 There's nothing charming or interesting about this design, the balconies don't look like they get a lot of light or are practical and the building materials don't look like they really tie into the colours of Griffintown's historical industrial and residential areas. But my big problem (as usual) is that, once again, they've gone with windows that hit the trifecta of awfulness; frames that cover too much of the surface space of the window opening, awkward sizing making putting in standard air conditioners more difficult and it doesn't seem the larger window sections open more than 1 out of the 4 sections. I don't get why these developers think people genuinely *want* to live in some Soviet-era Eastern Block peoples' housing or something that wouldn't look out of place in industrial Chabanel St.